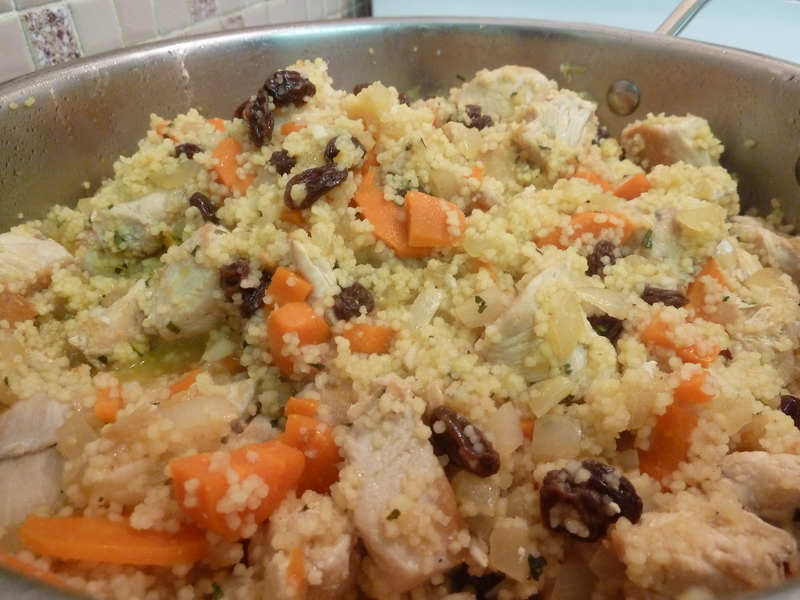 Savoury chicken couscous. It has couscous! You can pretend you are almost Moroccan. Serve this in a tagine, and people might think you really ARE Moroccan. Wouldn’t you be lucky? They have delicious food. This recipe is healthy (at least I think it is, I’m certain I got this from an Anne Lindsay cookbook, and anyone with a heart knows that Anne Lindsay is after us to eat with our cardiovascular systems in mind). Slivered almonds as long as you don’t have a spouse that adamantly refuses to eat food with “nuts” in it – yet he will eat an ENTIRE tin of wasabi almonds all by himself. 3. Do a little dance. 4. Look out the window and make sure no one is looking. 7. Cut up your chicken breasts (I use 3 breasts) in mini Borg cubes (about 1 inch) and cook (in a large pan) in a few tablespoons of olive oil until nicely browned and cooked well enough so you, and if you have them with you, friends and family, don’t get chickenella or whatever the disease is you get when eating undercooked chicken. While chicken is cooking, prep your carrots by peeling and slicing, chop up the onion in a small dice lest you know someone who doesn’t like onions, and don’t forget the garlic! Chop chop chop that garlic. Official recipe asks for one clove. You and I know that I think that is a joke. One clove of garlic? NEVER! So I did three cloves. Big ones. Make sure the person you are smooching at night, is the same one dining with you. 8. Remove cooked chicken from the pan. 9. Add chopped onions and carrots to the pan and cook for a few minutes. How long? Enough to check Facebook and Twitter for updates, take a swig of wine, adjust the music to suit your mood, and pretend, just for a moment, that you know how to sing. 10. Peek out the peephole in the door and make sure no one was in the hall that might have heard your caterwauling from #9 above. 11. Add the garlic, and cook for just a few minutes more. Make sure the heat isn’t high. You don’t want to burn that super-expensive garlic you personally imported from Vancouver Island. 12. Add the cooked chicken as well as 1 ¼ cups chicken broth, and 1 ¼ cups water (I put in 2 ½ cups chicken broth because I never finish the chicken broth in the 1 L container and then it sits in the fridge until it turns toxic). 14. Add hot pepper sauce (I use Louisiana Hot Sauce). I put in about a tablespoon, and will add more when plated. The amount you use, it completely up to you! The freedom! 15. Heat this to the boil, and then simmer for about 5 minutes. 16. Add ½ cup raisins, ½ cups slivered almonds, and your mint and/or parsley. I add mint because mint, to me, is more Moroccan than parsley. These things should be added just before serving. 18. Take picture of Savoury Chicken Couscous. 19. Write a blog about it. And, because we are on the topic of couscous, which is the teensiest of pastas, it makes me think of my newest cousin who is the teensiest of humans. 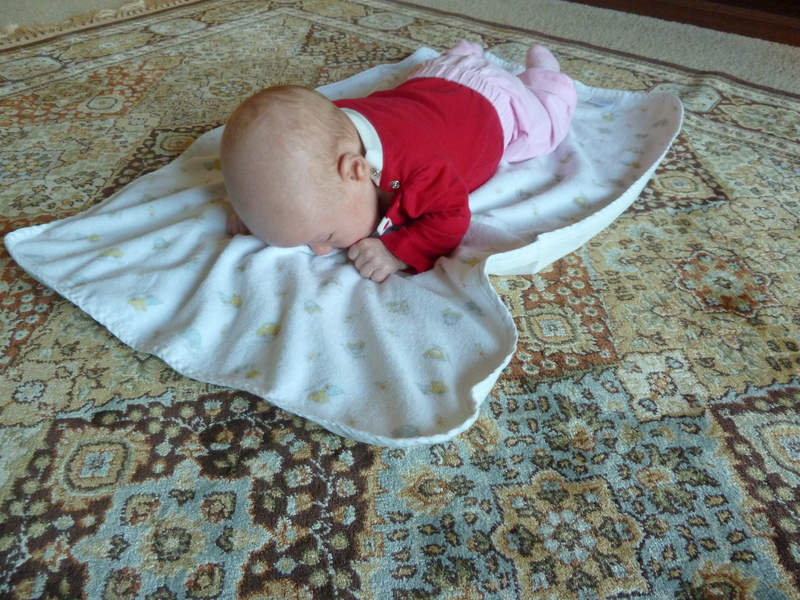 This is my cousin at 5 weeks old (last week). This was a BIG MOMENT in her little life. She apparently raised her head more than she ever had! I have taken a picture of this very moment!